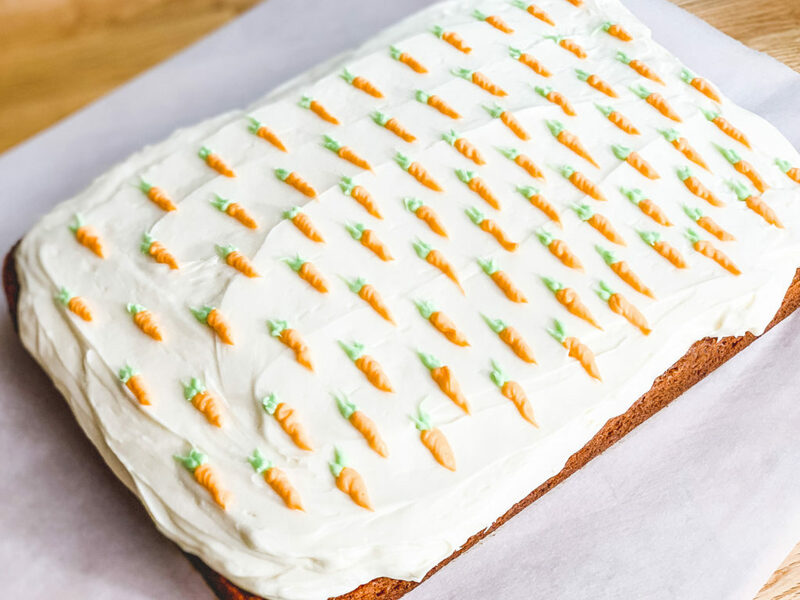 Carrot cake is one of those desserts that I tend to forget about until it’s right under my nose, and then suddenly I remember how much I enjoy it. Over the years, I’ve eaten my fair share of this often under appreciated treat, but I’ve never actually made one myself. At least, until now. 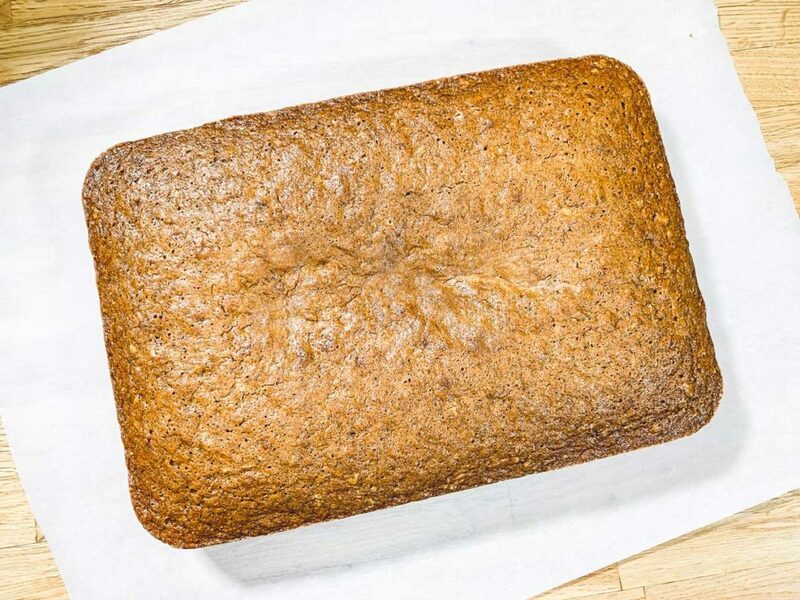 I combed through a lot of recipes online to get an idea of what ingredients typically go into a carrot cake, and was surprised to discover that a lot of them include coconut, raisins and/or pineapple. I took a moment to think back on the various carrot cakes I’ve eaten, and to contemplate what I did or not like about them. For starters, raisins were a definite no go. I’m sorry, but there are very few baked goods on this earth where raisins belong, and carrot cake is certainly not one of them. Coconut on the other hand, I do enjoy, but I find it can sometimes result in a dry or overly chewy texture. As for the pineapple…I don’t think I could say I’ve noticed pineapple in any of the carrot cakes I’ve tried before, but somehow the addition of this tropical fruit just sounds like it’s trying too hard. After my little contemplation session, I finally settled on this recipe from Sugar Spun Run because the ingredients were simple and the recipe was very straightforward. 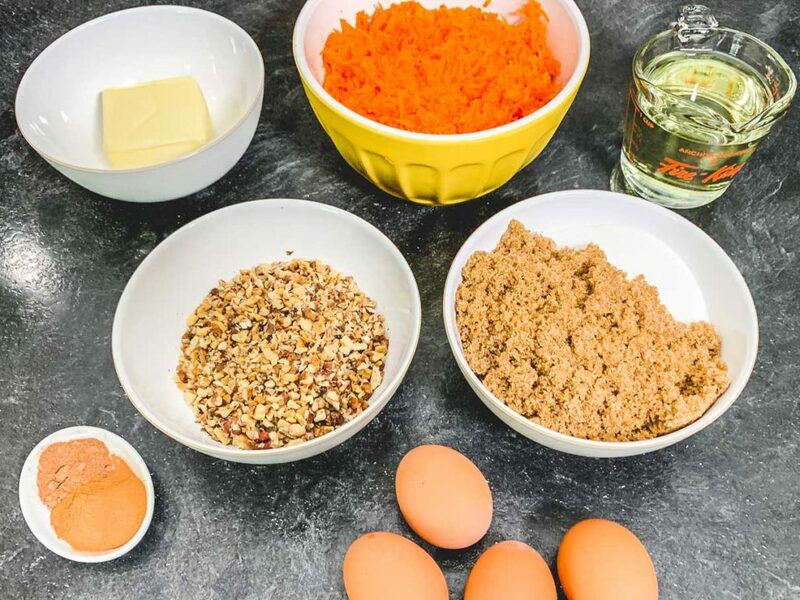 It seemed like a great starting point for an uncomplicated, but delicious, carrot cake. This cake really was excellent. It was moist and flavourful, but not super “carrot-y”. 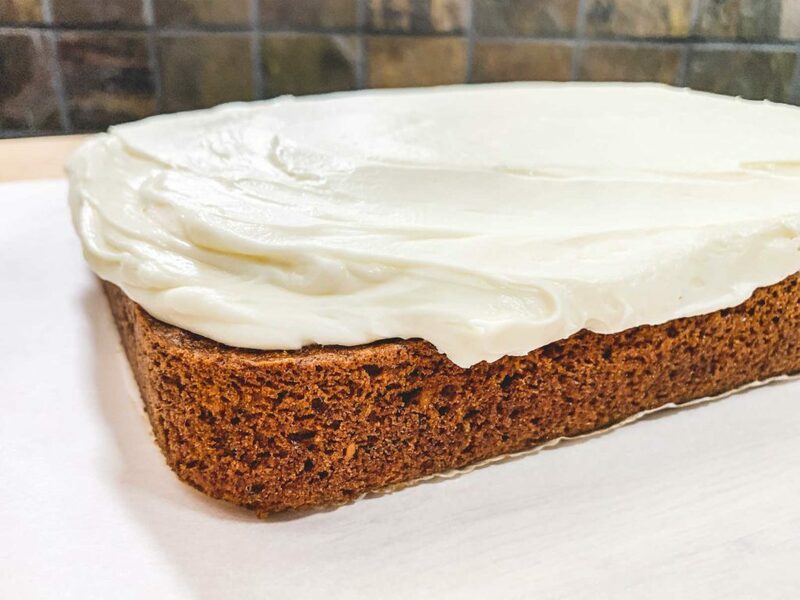 The cream cheese frosting pairs with the cake really well, adding just the right amount of sweetness. Best of all, it was dead simple to make. 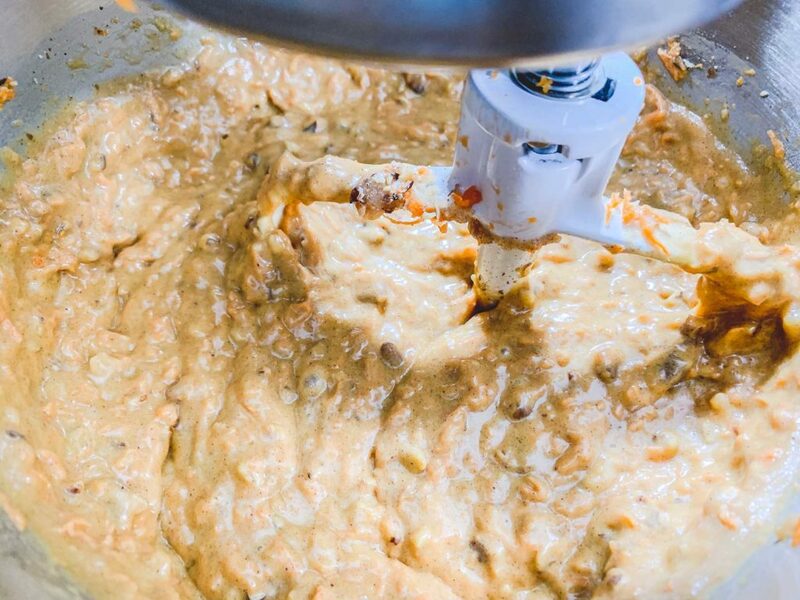 Start by mixing together all of your dry ingredients until well combined. I just threw everything into the bowl of my stand mixer and turned it on low speed for a couple of minutes until it was well mixed. Next add the oil and melted butter, followed by the eggs, one at a time. Then stir in some vanilla. Be sure to give it a good mix between each addition. Lastly, add the grated carrot and chopped nuts (either pecans or walnuts). The carrot I grated using the fine side of a cheese grater. I wouldn’t recommend grating with the larger side as this would really change the texture of the carrot in the cake. I ended up using a combination of both pecans and walnuts in the cake since I had a little leftover of each in my baking drawer. Regardless of which you use, it’s worth taking the time to lightly toast the nuts for a few minutes in the oven before adding them. Just throw them on a baking sheet and cook at 350°F until fragrant (about 5-10 min). The original recipe recommends baking this cake in two 8″ or 9″ round pans. I baked this in a 9″x13″ pan and it came out quite nicely. Just be sure to grease and flour whichever baking pans you use. My pan tends to stick, so I also used a layer or parchment paper on the bottom for good measure. Bake your cake at 350°F for about 40 minutes or until a tester inserted into the middle comes out clean, or with just a few moist crumbs. Let the cake cool in the baking pan for about 10 minutes before inverting it onto a cooling rack. Let the cake cool completely before starting on the frosting. 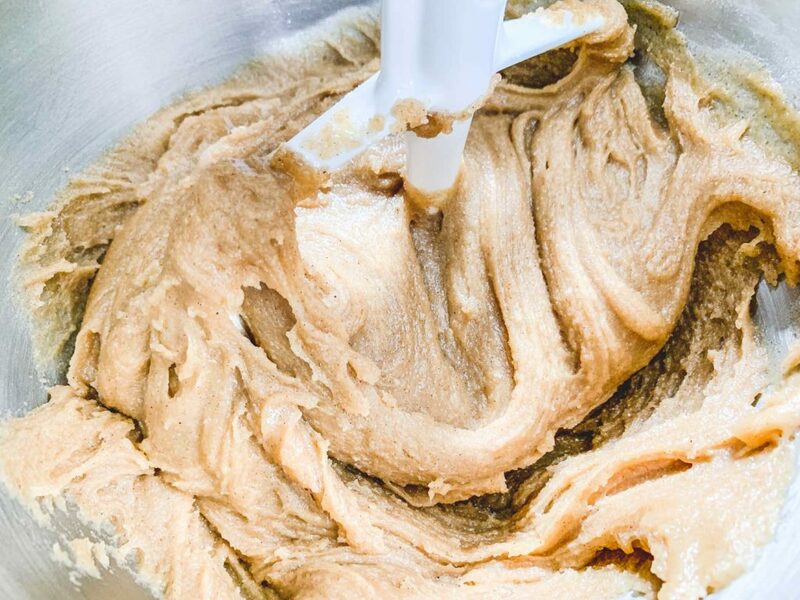 The frosting is super simple to make, and so delicious! Beat together some cream cheese and butter until smooth and creamy. Add in a little vanilla extract for extra flavour. Then, beat in the icing sugar, about a half cup at a time, mixing well in between each addition. Beat until smooth and creamy. Spread the frosting in an even layer on top of the cake. I found this recipe makes more than enough frosting to cover the top of a 9″x13″ cake in a fairly thick layer. I left the sides bare, but you could easily spread it down the sides as well if you wanted to cover the entire thing. 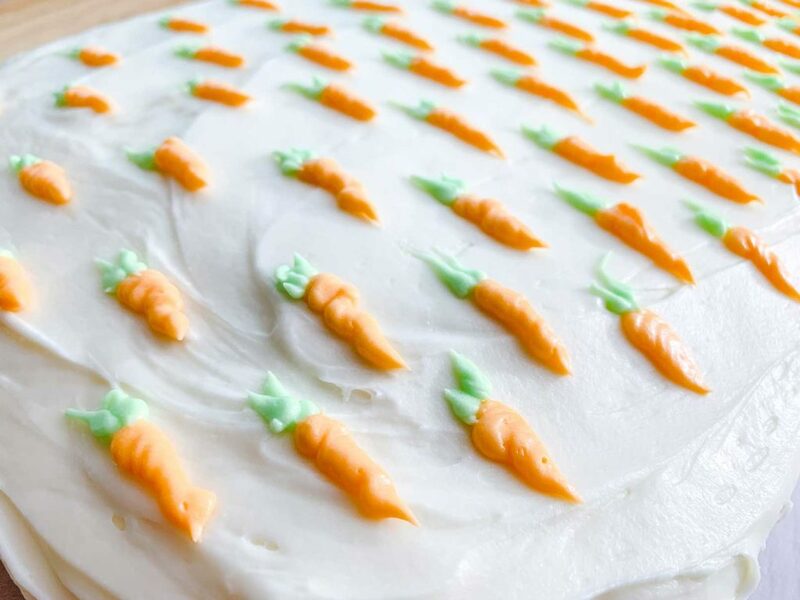 For a little decoration, I piped some tiny little carrots on the top of the cake. To make these, I reserved just a few small spoonfuls of the frosting before icing the rest of the cake. I tinted half of the reserved frosting orange and half green with some food colouring. I piped the carrots on using a small, round piping tip. I was really pleased with the end result of this cake. 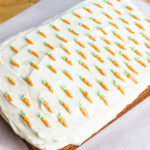 Not only was it delicious, but I had a lot of fun decorating it with the little orange carrots. I will definitely be making this cake again in the future. 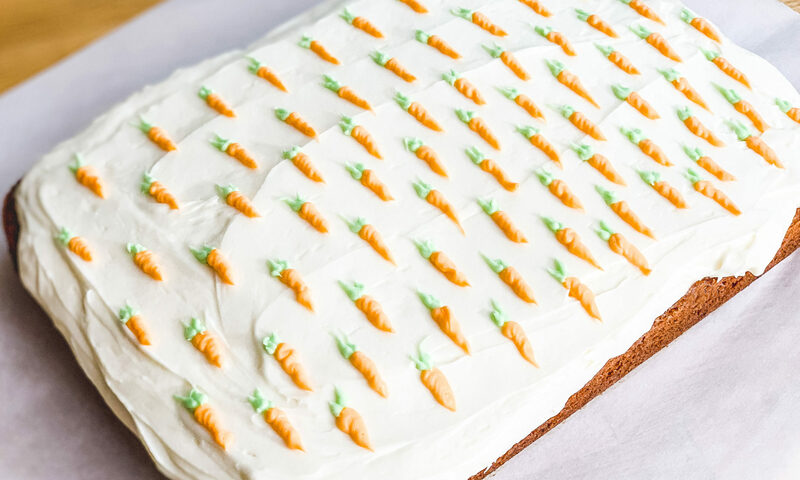 A straight up, no frills, unadulterated carrot cake, balanced with a perfectly sweetened cream cheese frosting. Pre-heat your oven to 350°F. Lightly grease and flour the inside of a 9"x13" baking pan (or two 9" rounds). 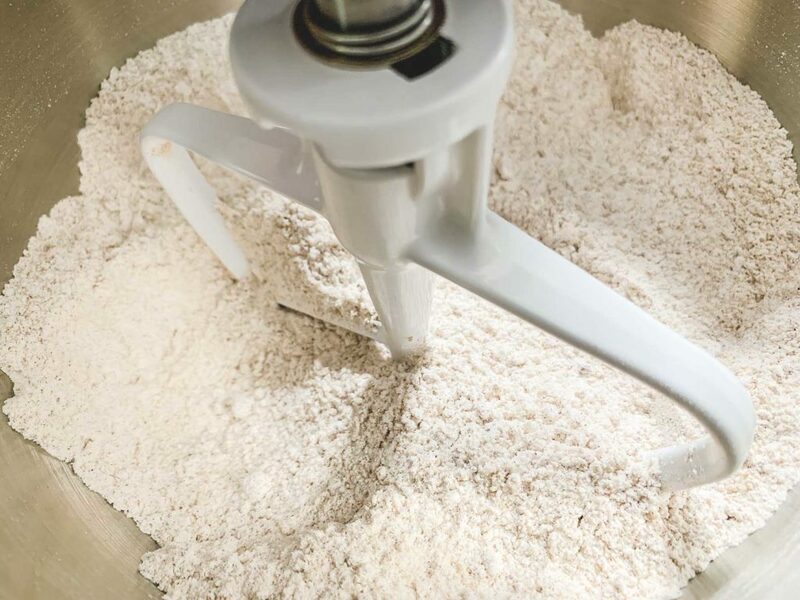 In a large bowl, whisk together the flour, baking soda, baking powder, cinnamon, nutmeg, salt, white sugar and brown sugar. Stir in the vegetable oil and melted butter until well combined. Stir in the grated carrot and nuts. Mix until well combined. 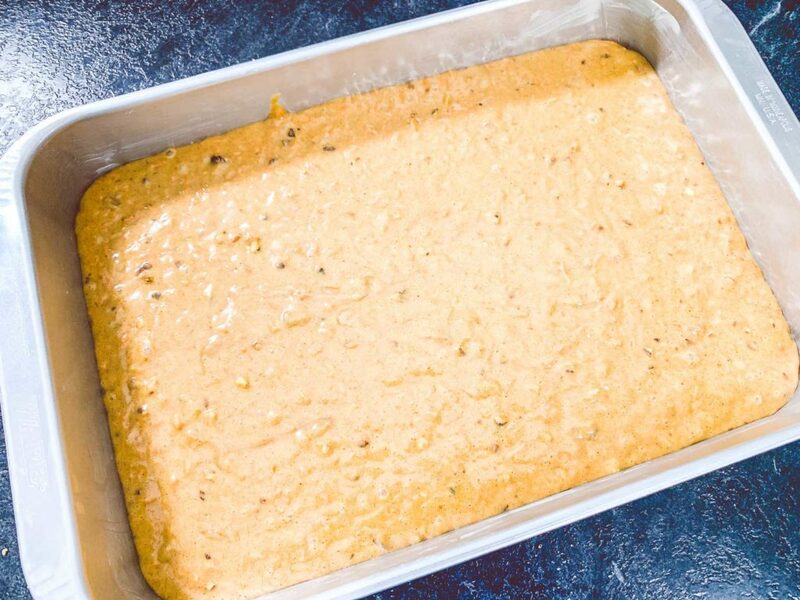 Pour the batter into your prepared pan(s) and bake for about 40 minutes or until a tester comes out clean when inserted into the centre of the cake. Allow the cake to cool for 10 minutes before inverting onto a cooling rack. Allow to cool completely before frosting. 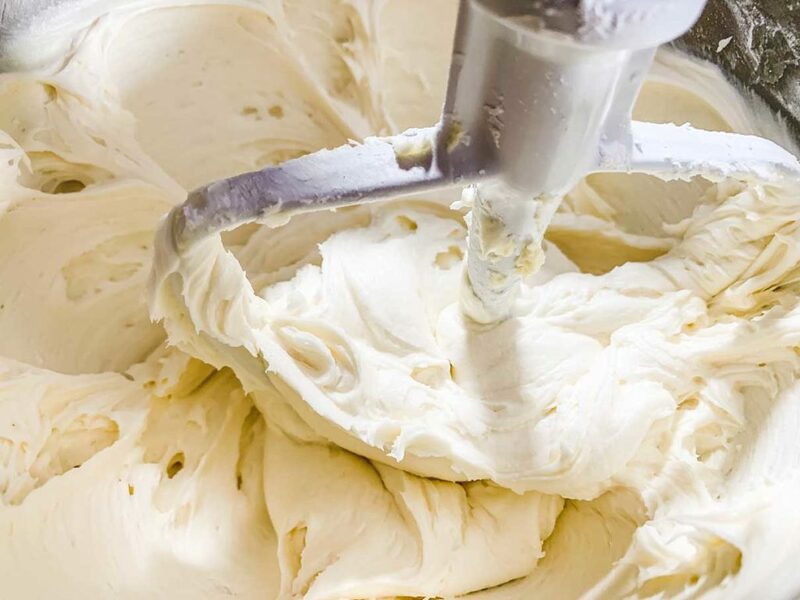 Beat the butter and cream cheese together on medium-high speed until creamy and smooth. Add the vanilla and salt and mix until well combined. Gradually add the icing sugar, one cup at a time, mixing well between each addition. Beat until well combined.